Redfish had the opportunity to engage with ITT, an 11 billion dollar global company, in the development of the Interconnect Solutions Divisions first consumer product. 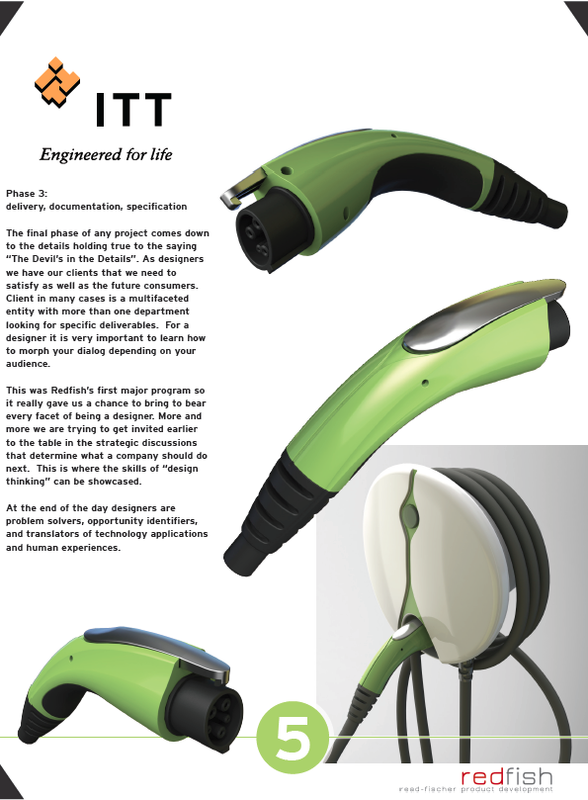 ITT was developing the human interface component of an electric car charging system known as a “Coupler”. Initially the biggest challenge was considering the “Paradigm Shift” in consumer behavior. There is considerable legacy consumer behavior around the fossil fuel experience that could not be overlooked. 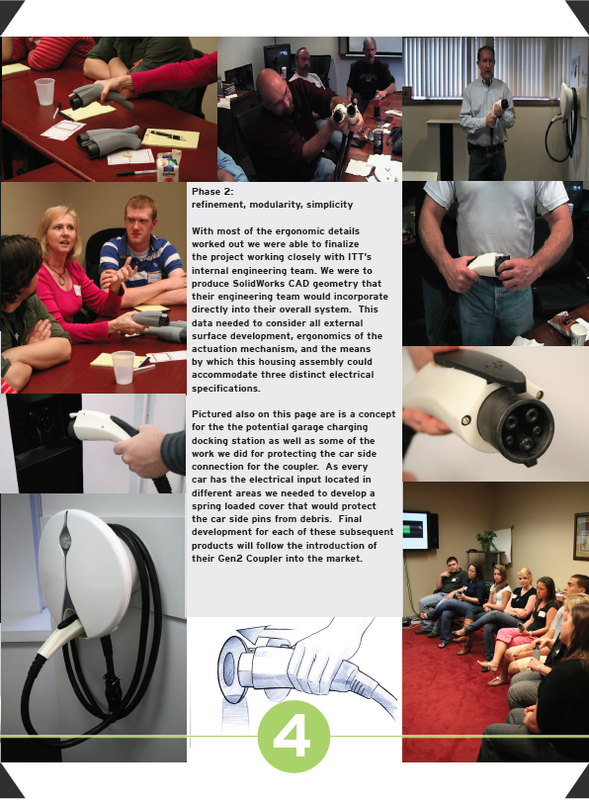 We were able to engage with various consumer groups throughout the program to validate our assumptions and qualify ergonomic features. In this rapidly growing and competitive market we managed to design a single housing that could be used with three separate interconnection specifications US, Europe, and China. We quickly had to start understanding who their potential customers might be and how this product would potentially get used. Considering early adopters we needed to weigh the cost of the electric vehicles coming on to the market against the younger more adaptable consumer. The older the driver the more legacy behavior that one has to overcome. We also needed to understand the limitations of the charge to mileage ratios when understanding who would be the best candidate for a vehicle of this nature. 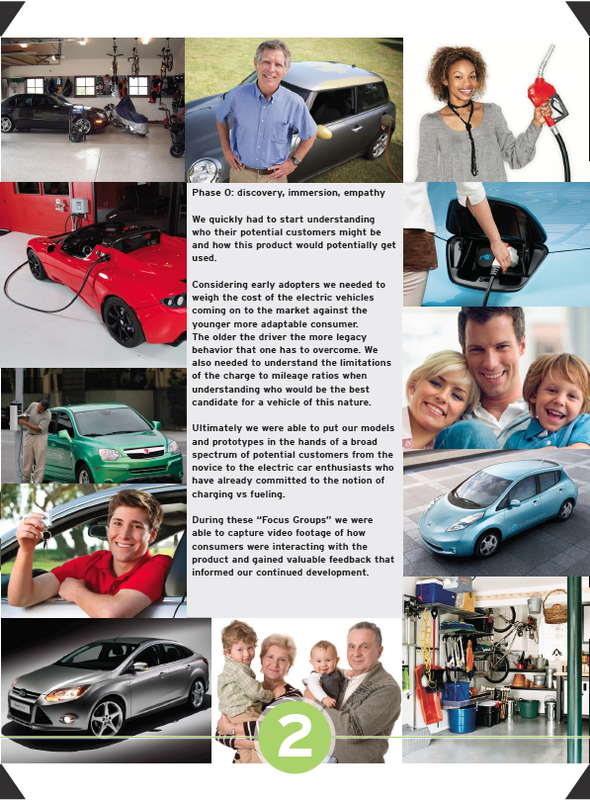 Ultimately we were able to put our models and prototypes in the hands of a broad spectrum of potential customers from the novice to the electric car enthusiasts who have already committed to the notion of charging vs fueling. During these “Focus Groups” we were able to capture video footage of how consumers were interacting with the product and gained valuable feedback that informed our continued development. In this phase we were able to employ all the knowledge gained in Phase 0 and test some of our assumptions. Our initial review meeting was conducted with ITT engineering and marketing personnel. 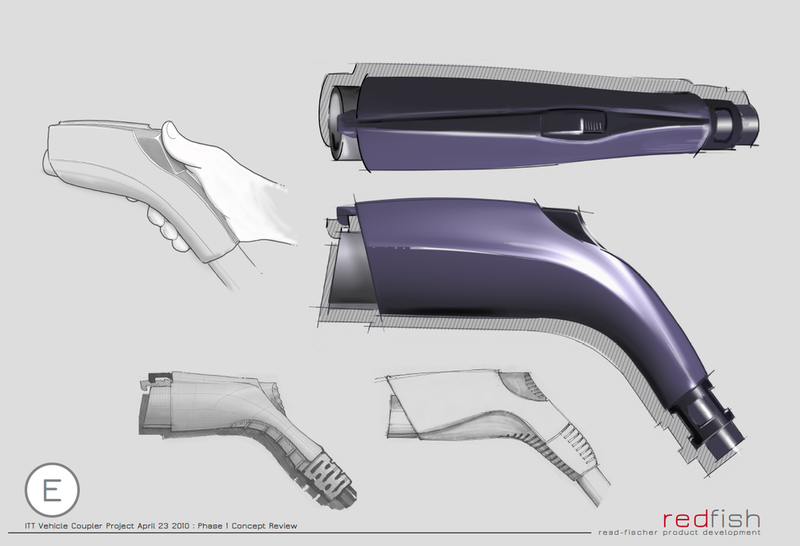 We provided them with a series of two dimensional renderings and accompanying foam models that they could interact with. After this meeting we were able to distill the concepts down a bit and bring them to potential customers to gauge their initial reactions. Feedback taken from this meeting informed us that we need to take three of the concepts further to evaluate mechanisms and overall ergonomics. Our next meeting was with an enthusiast group with functional prototypes, each with a unique method of actuation. Following this meeting ITT was able to secure some intellectual property for a mechanism that we developed and also clear direction for the final product features. This was the point in the program when they added the European and Chinese spec to the equation. 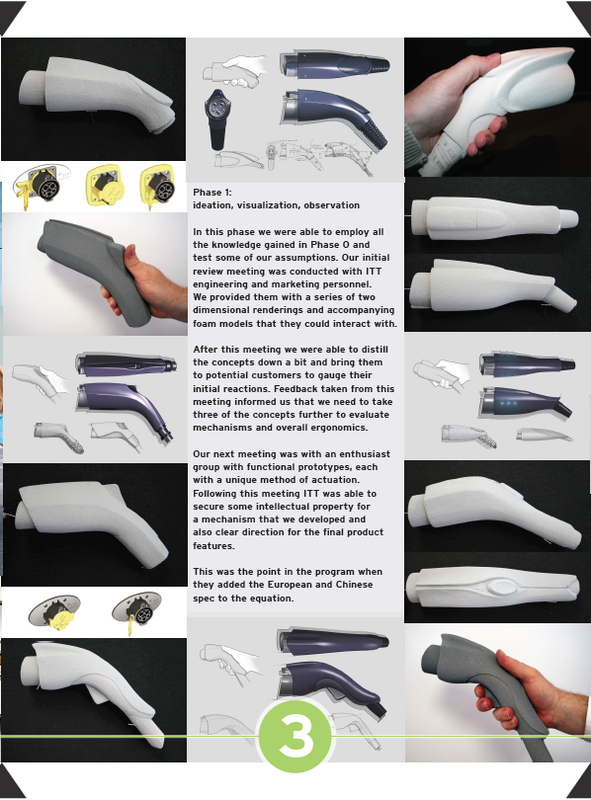 With most of the ergonomic details worked out we were able to finalize the project working closely with ITT’s internal engineering team. 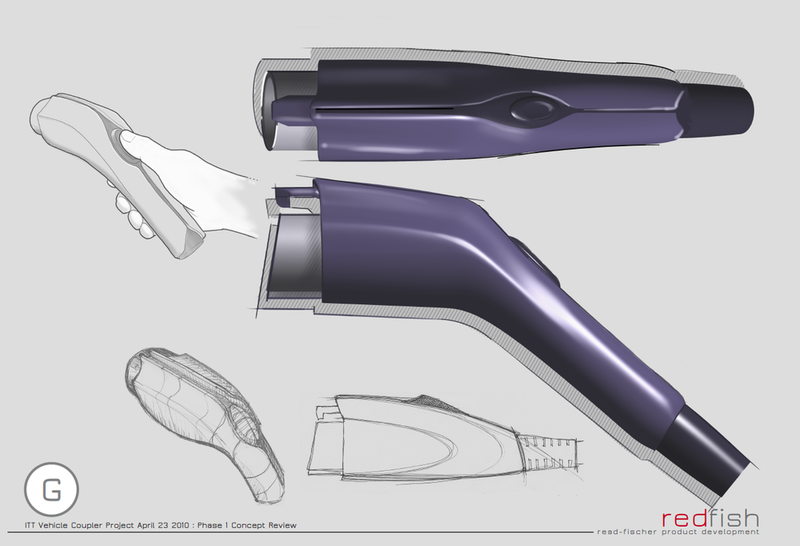 We were to produce SolidWorks CAD geometry that their engineering team would incorporate directly into their overall system. 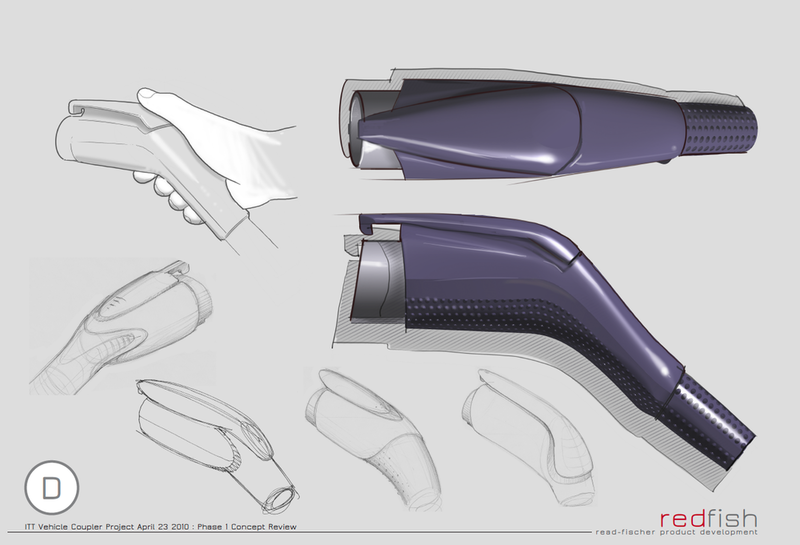 This data needed to consider all external surface development, ergonomics of the actuation mechanism, and the means by which this housing assembly could accommodate three distinct electrical specifications. 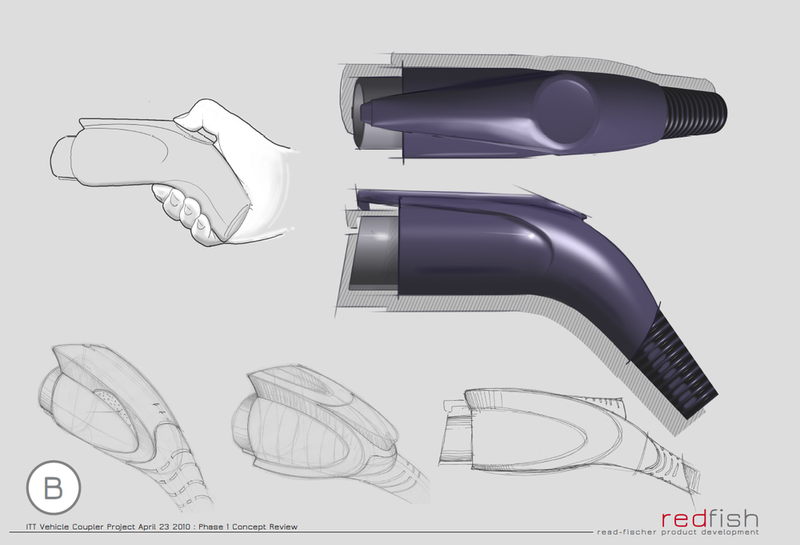 Pictured also on this page are is a concept for the the potential garage charging docking station as well as some of the work we did for protecting the car side connection for the coupler. As every car has the electrical input located in different areas we needed to develop a spring loaded cover that would protect the car side pins from debris. Final development for each of these subsequent products will follow the introduction of their Gen2 Coupler into the market. 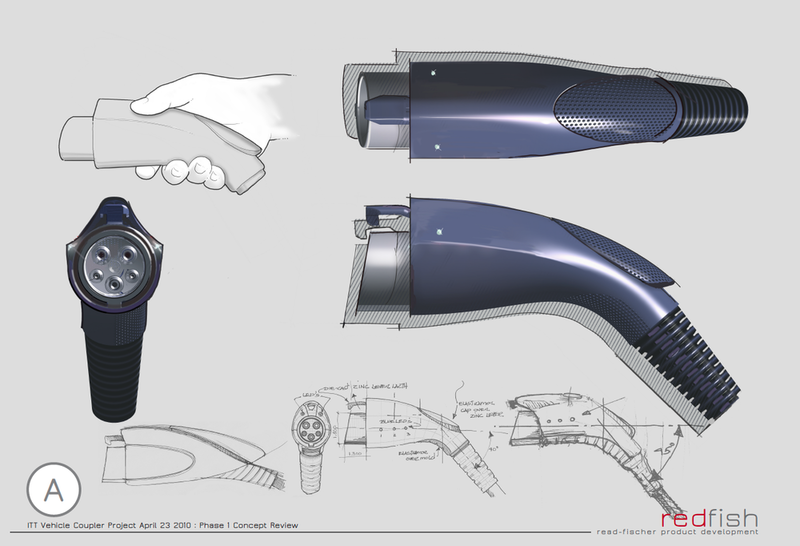 The final phase of any project comes down to the details holding true to the saying “The Devil’s in the Details”. As designers we have our clients that we need to satisfy as well as the future consumers. Client in many cases is a multifaceted entity with more than one department looking for specific deliverables. For a designer it is very important to learn how to morph your dialog depending on your audience. This was Redfish’s first major program so it really gave us a chance to bring to bear every facet of being a designer. More and more we are trying to get invited earlier to the table in the strategic discussions that determine what a company should do next. This is where the skills of “design thinking” can be showcased. At the end of the day designers are problem solvers, opportunity identifiers, and translators of technology applications and human experiences. ITT’s Interconnect Solutions business is displaying its new second-generation J1772 electric vehicle charging connector, which provides a full charging solution for electric vehicle service equipment (EVSE) and plug-in hybrid electric vehicles (PHEVs) in less than four hours. 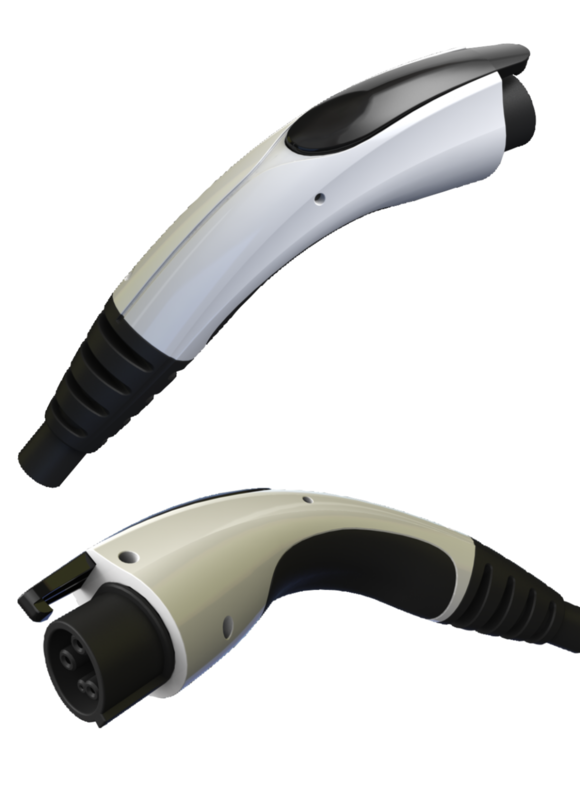 The new connector features an ergonomic handle textured for improved grip – an important design enhancement for EV drivers who handle the connector on a daily basis. July 5, 2012, BEIJING — ITT Corporation (NYSE: ITT) is appearing this week at the 8th annual Beijing International Pure Electric Vehicles, Hybrid Electric Vehicles and Clean Energy Vehicles & Auto Parts Exhibition (IEVE China), where it is showcasing world-leading electric vehicle (EV) charging connector solutions tailor-made for the world’s largest auto market. The company’s Interconnect Solutions business is displaying the new second-generation J1772 electric vehicle charging connector, which provides a full charging connector solution for electric vehicle service equipment (EVSE) and plug-in hybrid electric vehicles (PHEVs) in less than four hours. The new connector features an ergonomic handle textured for improved grip – an important design enhancement for EV drivers who handle the connector on a daily basis. 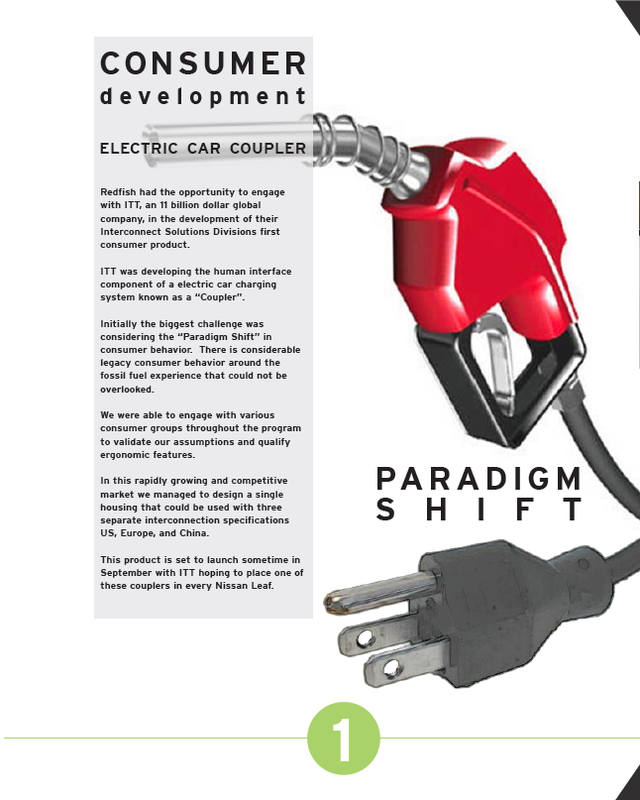 ITT’s second generation SAE J1772 was developed based on the award-winning first generation J1772 high-reliability electric vehicle charging connector and leverages HEP contact technology. The company launched both the IEC International and GB China standard-conforming technology simultaneously.